Invited your nearest and dearest to your festive celebrations thanks to our wonderfully jovial Ho Ho Ho Invitations. Our landscape invitations measure 178mm by 127mm and can be personalised with up to three lines of text with one of our fantastic range of ink colours printed on to plain 400gsm paper stock, leaving stunning white lettering shining through. 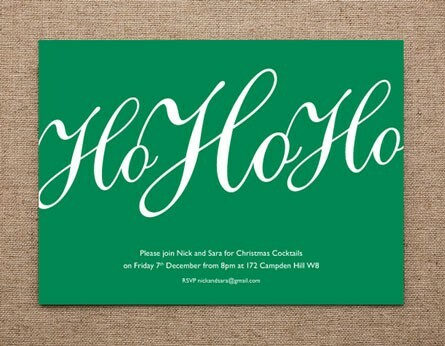 Supplied with matching envelopes and available in quantities from 10 to 250 our Ho Ho Ho Invitations are great fun.